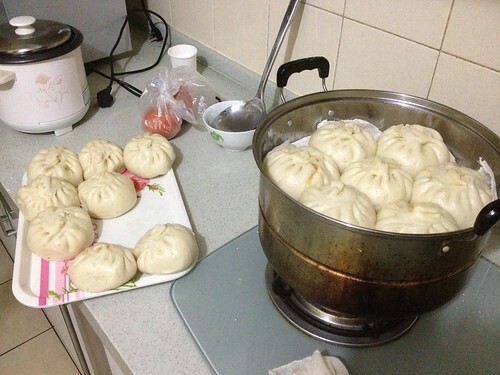 Earlier, I blogged about paos or buns. Even had a bit of fun in the subsequent entry. Hehe. Anyway, I returned to the Capital only to discover that the wife of one of my managers came by for a visit and decided to cook us dinner. The buns as you can see above are made by her from scratch. Call me suakoo but the buns I know are all machine manufactured in some factory somewhere. I had the most awesome privilege to actually see one (or 15) being made from scratch. From the flour to the mincing of meat to the filling to the steaming. The first batch was seasoned with fresh fennel and then she made a second batch using celery for next day's breakfast.